Wheat ready for harvest is seen on September 29, 2010 near Tioga, North Dakota. US agriculture giant Monsanto, in the spotlight over the discovery of unauthorized genetically modified wheat growing in Oregon, said Wednesday it has a new GM wheat strain under development. US agriculture giant Monsanto, in the spotlight over unauthorized genetically modified wheat, said Wednesday it has a new GM strain under development after an eight-year freeze. The company is developing a new form of wheat impervious to its Roundup herbicide in a bid to improve yield, Monsanto chief technology officer Robb Fraley said in a conference call with reporters. Claire Cajacob, head of Monsanto's wheat research, said the company was testing a genetically modified, or genetically engineered, spring wheat in North Dakota, adding that field tests started in 2011. Genetically modified wheat is not currently authorized to be grown commercially anywhere in the world. The latest announcement comes a week after the US Department of Agriculture (USDA) revealed that GM wheat resistant to Roundup had been found in a farmer's field in the northwestern US state of Oregon. Neither US authorities nor Monsanto have explained how the strain ended up there, but Monsanto said it has not excluded any possible causes, including an accident or some kind of sabotage. Monsanto ended Oregon field tests in 2001 and stopped testing its original Roundup Ready wheat strain nationwide in 2005 amid market concerns about the acceptance of GM products. But it pushed back into the field in 2009, resuming work on wheat with the purchase of WestBred, a biotech wheat developer. Monsanto's original Roundup Ready GM wheat strain, though approved as safe by the Food and Drug Administration, was not authorized for commercial use at the time Monsanto ended the tests. And Fraley said all first-generation GM seeds tested until 2005 were either destroyed or sent to a USDA facility in Colorado for storage. He pointed the finger at "the accidental or purposeful mixing" of the Roundup Ready wheat in the farmer's wheat field. Bill Freese, of the anti-GMO Center for Food Safety, refuted Monsanto's claims of possible sabotage. "I don't see any evidence at all that it is sabotage," he told AFP, accusing Monsanto of trying to evade responsibility. Freese said cross-pollination may have occurred during Monsanto's field testing in at least 17 states from 1998 to 2005 and that the strain found in Oregon may have come from the old test crops. Monsanto officials have insisted that wheat seeds cannot survive in a difficult climate like Oregon for more than two years and that wheat pollen cannot travel more than 30 feet (nine meters) from its source. But Freese said cross-pollination can occur across a distance of as much as 1.7 miles (2.75 kilometers) "under the right conditions." "Seeds are left in the ground. There is no way you can capture all of the seeds," he added. The seeds can also sprout and mix in with conventional ones, and GM seeds can also fall out of trucks, he said. 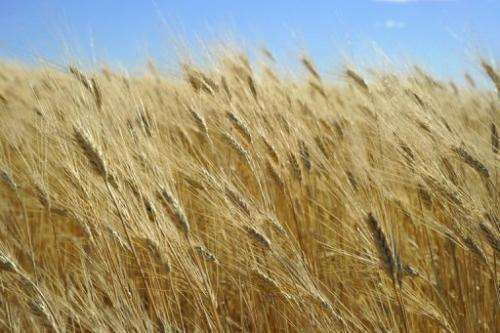 Freese's group is calling for a halt to ongoing tests on GM wheat until the Oregon case is resolved, noting that the North Dakota tests are spread across a very large area, which he says increases the risk of cross-pollination. A Monsanto spokesman said it would take at least 10 years to commercialize a new GM wheat strain. The GM wheat discovery rattled export markets sensitive to genetically modified organisms, and Japan suspended imports of some US wheat, as did South Korean millers. In Europe, officials said they would check US imports for signs of the GM wheat.